The Nordic and Celtic peoples who settled Iceland in the 9th century came from lands with rich traditions of folklore, where the mythical and supernatural were part of daily life. The found an island of striking beauty, with inland valleys, richly grassed and forested lowlands, massive glaciers, and impressive volcanic mountain ranges. They also found a land teeming with spirits of nature and mythic creatures. 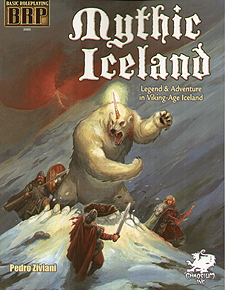 Mythic Iceland offers Basic Roleplaying players the experience of living and adventuring in the Iceland described in the Sagas and in Icelandic fairy-tales. In mythic Iceland, all the creatures of myth and all the magical aspects of life really do exist, and they play a major role in people's lives, The elves, or hidden folk, exist hidden from the eyes of the common folk, and sometimes meddle in their affairs. Those travelling through the highlands risk being attacked by trolls, and often curses and spells are laid on neighbours and enemies. This is a supplement for the Basic Roleplaying System. You must have at least one copy of those rules to enjoy this book.